For Abe, 12 (played by Noah Schnapp of Stranger Things) and living in Brooklyn, navigating the various roots of his family’s identities that clash far more often than they interact would exhaust the capabilities of many adults. His mother is Israeli-Jewish and father is Palestinian-Muslim. However, both parents, who also are lawyers, have raised him without pushing any religious practice or identity, much to the consternation of the grandparents on both sides of his family. The film Abe, which received its world premiere as part of this year’s Sundance Kids program, is a marvelous piece of entertaining cosmopolitanism that invokes several epiphanies that are as instructive to adults as they are to kids. Directed by Fernando Grostein Andrade, who has built a career as a journalist and as a documentarian in Sao Paolo, Brazil, Abe entices audiences with a well-developed family story that happens to revolve around a bounty of food imagery from several cultures. 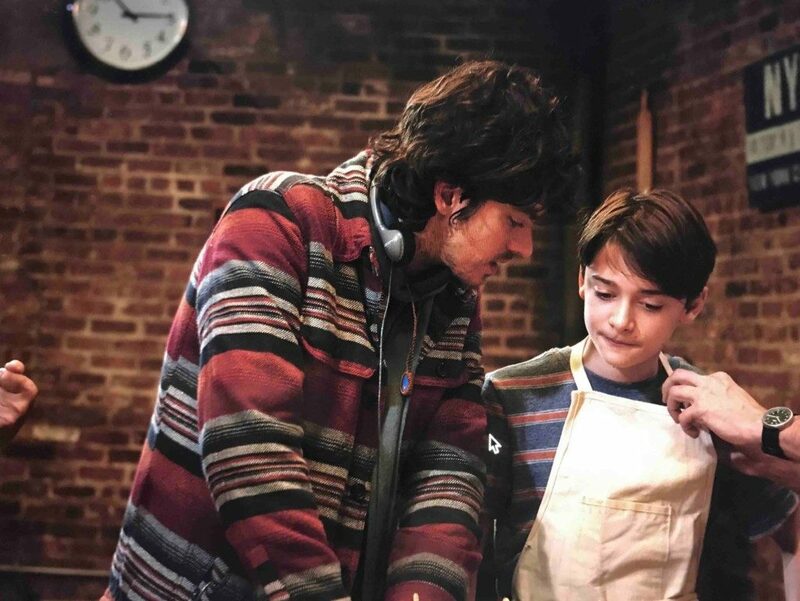 Fernando Andrade, director, and Noah Schnapp in Abe. Andrade, 38, says in an interview with The Utah Review that the project was some 13 years in the making. He explains that he empathizes with Abe’s experiences, as he was raised in a family, that included Holocaust survivors, with Jewish and Catholic roots constantly intersecting and shaping their lives. Social media platforms are integral not only in the film’s opening shots but also in how Andrade has promoted the film, prior to its release. This parallels Andrade’s approach where he has used social media platforms (including YouTube) to highlight his film work dealing with LGBTQ and women’s rights, as well as responses to racist movements in Brazil. This includes Quebrando o Tabu, which debates the legalization of drugs. Abe shares his love for food on social media accounts including Tumblr and Instagram. He remembers the excellent culinary skills of his late grandmother on his mother’s side. He decides to bake his own birthday cake (lemon poppyseed) and it does not turn out as expected, because he didn’t have baking powder on hand. His mother, who does not have the same passion for cooking, tells him to use baking soda and she refuses to let him mix baking soda and cream of tartar as a substitute. 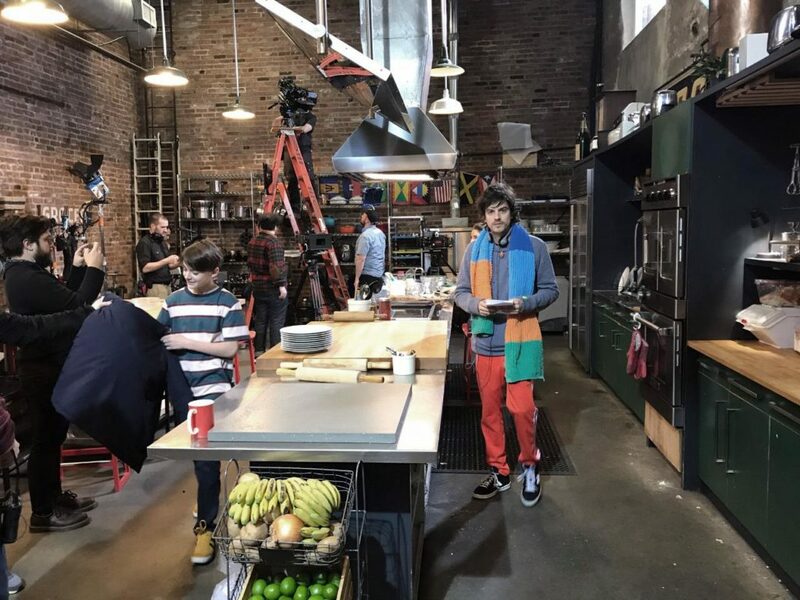 Without his grandmother, Abe wants to find a suitable outlet to perfect his culinary skills so that his followers – including one who makes it a habit to cyberbully him about his shortcomings – will be impressed at what he is able to accomplish in his kitchen. He tries mixing cultural tastes but experiments like a ramen taco fall flat. His parents sign him up for a cooking camp that is woefully below his skill and age level. This is just one example of Abe’s frustrations. He takes an interest in his Palestinian grandmother’s cooking and she is willing to help him learn. He also is interested in learning about various Muslim practices, such as fasting. Abe is motivated to incorporate both Jewish and Muslim practices, which disappoints everyone in the family. His secular parents (his father is an atheist) deliberately have avoided religious practices, knowing the strong conflicting feelings of the grandparents on both sides of the family. These tensions also are beginning to strain the relationship between Abe’s parents, who are contemplating separation. Andrade brought Lameece Issaq and Jacob Kader, Palestinian-Americans writers, on board to write the screenplay that animates authentically the emotional dynamics of the film’s storyline. He had learned of Food and Fadwa, a play that Issaq and Kader wrote and which received numerous positive reviews in its New York City premiere seven years ago. Kader, whose family lived in Orem, Utah, says in an interview that the experience of writing the play helped him and Issaq find the right hybrid to explore the commonalities that Andrade wanted to explore in Abe. Kader’s family experiences included roots of his Palestinian heritage as well as the newfound interactions with Mormonism. On the set of Abe. Food and Fadwa was set near Bethlehem, where a Palestinian family has been placed under virtual house arrest, an inauspicious time as a woman (Fadwa) must contend with her aging father’s dementia and her sister’s wedding that is scheduled to take place that week. The main character is an expert cook who is preparing all the food for the wedding. The bride and her new husband are planning to come to the U.S. to work at a relative’s restaurant in New York City. This causes resentment and eventually at a dinner the family members explode in an argument about the borders involved in the Israeli-Palestinian conflict, where they end up using and throwing food to illustrate their points in the debate. In Abe, Kader says “that we tackled the topic of absorbing and assimilating cultures in a different way,” adding that the film shows the various culinary traditions that are cross-overs between the Jewish-Israeli and Muslim-Palestinian sides. As Abe seeks to explore how these culinary crossovers might help to settle his family’s differences, he ventures out late one night and meets Chico, a Brazilian chef (a first-rate performance by Seu Jorge). Abe persists, hoping that Chico can help him master the skills of fusing flavors from different culture. Abe ditches the pitiful cooking camp his parents selected. Andrade adds admirable thematic heft to this film about children. When Abe starts as a protégé with Chico, the chef has him wash dishes and take out the garbage (a familiar scene to any aspiring chef who hopes to make it in a restaurant kitchen). It’s an instructive scene with a white kid from an upper middle-class family who learns about the humble start from an immigrant who undoubtedly started his career on the same path. Andrade is particularly proud of the diversity of first- and second-generation immigrants who worked on his film — from cast members to screenwriters and story developers and to the cast and production crew. “Everything happened so naturally and it is reflected in the film,” he says. The film’s cosmopolitan tone is accentuated by the musical score composed by Brazilian Guilherme Amabis. In fact, the most challenging aspect of the production was coordinating budget availability, as any independent filmmaker knows. Shooting the film occurred during some of New York City’s coldest winter periods, and the production crew used CGI effects to change the scenery to warmer times of the year, to match the story line. 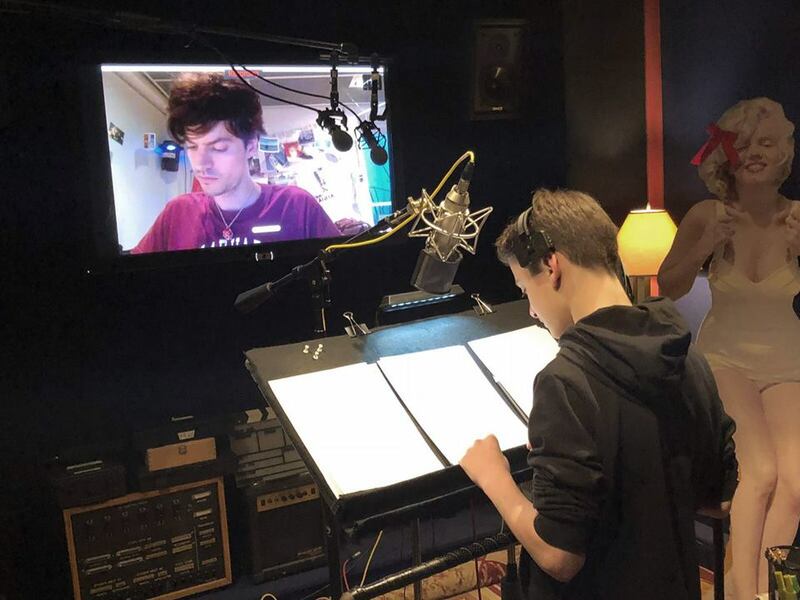 Noah Schnapp and Fernando Grostein Andrade. When Abe decides to prepare a Thanksgiving feast for his family that showcases the crossover flavors and culinary techniques of both cultures, he hopes that the food finally will unite his family. It leads to an emotional, no-holds-barred argument at the table and some of the most stringent barbs drive Abe to run away. Andrade says that scene offers a lesson about forgiveness, especially at moments when people say things they really don’t intend to do but they are blurted out in a spontaneous moment of uncontrolled anger. Andrade is rightly proud of a film that should enjoy a long productive run on the festival circuit and as a pickup for distribution and release. He says Schnapp was a consummate professional. “He never forgot a single line in a complex script, and he never needed to refer to the script,” Andrade adds. Additional screenings will be Jan. 31 at Park City’s Prospector Square Theatre and Feb. 2 at 1 p.m. in the Redstone Cinemas of Park City.